I heard a podcast yesterday where a Jewish woman who had been rescued from the Holocaust said she wanted to make her life worthy of being saved. It struck me how often I have heard that from survivors of horrific events, especially if they lived while the one who saved them died. These survivors often go on to do amazing things, fueled by this desire to avenge their rescuer’s death – to make it worthy. It fascinates me – this trigger to live an amazing life. So I tried to imagine what it would be like to experience this type of situation. I kept picturing it as being trapped in a burning building – engulfed in flames, scorching heat, and suffocating smoke. How would I feel to be rescued from the pain and suffering of burning alive? And how would I feel if afterwards I realized the firefighter who saved me died? That he sacrificed his life for mine? I would be devastated. I would have unanswerable questions and guilt. Why me? What have I done to deserve to live while someone so heroic died? What will I do to make his sacrifice worth it? I tried to imagine what it would be like to then meet my rescuer’s family. Staring into his mother’s eyes, knowing she has to go on living without her precious son because of me, what would I feel? Excruciating heartbreak. Intense sorrow. Immeasurable pain. Just imagining this scenario brings me to tears. But I would also feel an overwhelming desire to make it right. Not that I could bring back her son, but that at some level, his sacrifice would be worth it. I would absolutely without a doubt live my life to the fullest, in honor of him. It would feel selfish to waste even one second. I would be passionate about making an impact on this world, so that he didn’t die for nothing. That sounds really honorable, doesn’t it? Most would agree it makes sense; it’s the right thing to do. But what if it didn’t go down that way? What if I started playing games on my phone during the memorial service? What if I didn’t even show up to the service? What if I was too hung-over from partying the night before? What if I just didn’t feel like it? What if the game was getting ready to start and I really didn’t want to miss kickoff, so I just stayed home? Would you be horrified? Would you think I was ungrateful? Would you think I was selfish for wasting the opportunity that cost someone else everything? Would you go so far as to say something like “she didn’t deserve to be saved”? Would you post it on Facebook and Twitter so everyone could let me know what a horrible person I am? Yet isn’t that what is happening here every single day? Jesus died for us. He suffered a horrific death to save us from a horrific event. His mother watched as they beat and whipped Him. She watched as they mocked Him with a crown of thorns and forced Him to carry His own cross. She watched them drive nails through His hands and feet and plunge a sword into His side. Yet every day we don’t show up for the meeting to look her in the eyes. We don’t often go to His Father’s house. Too busy. Too tired. Don’t feel like it. If we do show up out of some sense of obligation, we simply go through the motions, and our lack of passion says “I’m not really that moved by the fact that He saved me”. We would rip someone to shreds via social media if they treated a fallen hero like that. But we let ourselves get away with treating Jesus like that every single day. Why do we act like this??? Even those of us who are Christians, who believe He died for us, are walking around like this is no big deal. I know because I’m guilty of it. We show up to church (sometimes) and complain because we don’t like the music or because the sermon was too long or we didn’t get anything out of it. We pray (sometimes), but not for long because we’re tired or busy or both. We give money (sometimes), but not so much that we would have to give up our daily Starbucks. We volunteer (sometimes) out of obligation, to check it off the list. We are lukewarm. Why? Because even though we are trapped in a burning building, Satan has convinced us we aren’t burning! Society has offered us every comfort, and we have gladly traded reality for it. Surrounded by our riches we don’t feel a need to be saved. When we hear the story about how Jesus saved us 2000 years ago, we don’t feel connected to the actual event, so we aren’t passionate about living a life worth saving. We don’t feel the real danger, and so we don’t feel real gratitude. It begs the question, what has to happen to wake us up? Do we have to suffer real, intense danger before we want to be saved? Do we have to lose everything worldly to awaken the desire for everything heavenly? Will it be too late when that happens? Or can we overcome this now by choosing a life of humility, service, kindness, and love? What if we chose a purposeful, passionate life in honor of our hero? He gave us free will to choose. I pray we choose Him. Through His death, He gave us grace. We don’t have to earn it; we don’t have to live a life worth saving. But when I think about what He sacrificed so that I could live, every fiber in my being wants to live a life worth saving! I would be disgusted with myself if I didn’t attempt to make an imaginary firefighter’s death worthy. Why would I expect anything less for my very real Lord and Savior? Why!? It’s time to wake up to reality. To internalize what really happened. To get passionate about making an impact, and disgusted by feeling lukewarm. To let our actions show the belief that we have been rescued from the most horrific event, and our rescuer suffered and died saving us before rising again. Everyone deserves to be saved from their burning building. He died to save every last one of us. I pray we won’t continue to turn our backs on that very real gift. What a different world this would be if we survivors lived our lives in honor of our hero. If we didn’t waste another second. If we stopped going through the motions, and started living on purpose. So out of gratitude for the One who rescued me, I’m done being lukewarm. 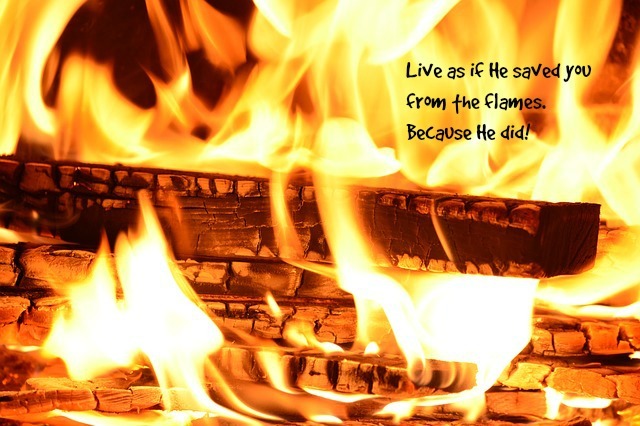 I’m determined to praise Him by living a passionate life worth saving!